(county) 1 Senior and 1 Junior All Ireland. 6 Connacht titles. Favourite Sporting Moment: Winning All Ireland with club in 1999 and county in 2004. 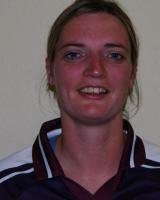 Favourite Ladies Gaelic Players: Becky Mc Philbin, Lisa Coohill and the Ward twins, Nicola and Louise. Influences on your career: My family, P. J. Fahy and my husband Kieran Collins.